In this video we will discuss SQL Server except operator with examples. Let us understand this with an example. 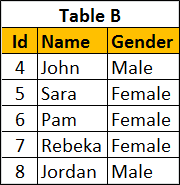 We will use the following 2 tables for this example. Notice that the following query returns the unique rows from the left query that aren’t in the right query’s results. 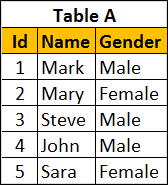 To retrieve all of the rows from Table B that does not exist in Table A, reverse the two queries as shown below. You can also use Except operator on a single table. 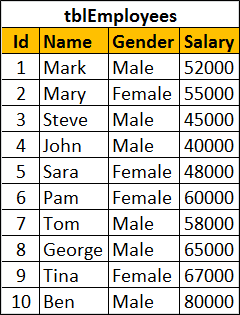 Let's use the following tblEmployees table for this example.